First of all it was Woolworths. This wonderful shop from which I had purchased my first 45 rpm record (T Rex singing “Ride a white Swan“) closed a few years ago. Oooh – I was only 8years old but Marc Bolan was the prettiest bloke I had ever seen. I had been given a record token (who remembers them?) for my birthday. It was a few months later that I heard him singing and my love affair with men wearing tight pink clothing began. 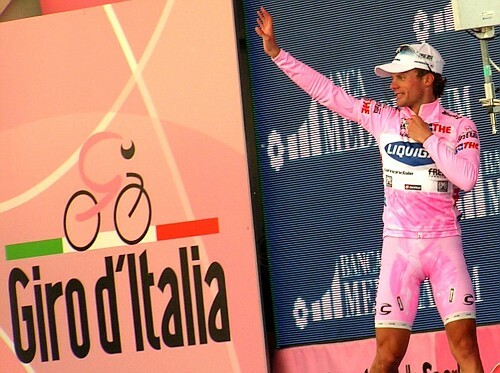 Ever since I’ve been addicted to the Giro d’Italia cycle race. And now, 42 years later, as the Giro rolls across Italy, I am approaching the big Five Oh No. To coincide with this event “Clintons Cards” announces the closure of about half its outlets. Seemingly they are a victim of the e-card, rather in the way that dead tree books are becoming a victim of the e-book. I am not sure how I feel about any of this. In order to celebrate my birthday I’m giving away digital copies of “Knockout” on Amazon Worldwide ( USA UK FRANCE GERMANY ITALY & SPAIN) during Thursday 17th and Friday 18th May in the hope of reaching the big 50 in the charts as well as in my bones, teeth and soft components. As a special salute to “Clintons Cards” and the dead tree book industry, I am also giving away signed copies of my paperback on Goodreads – all entries to be in by Sunday 20th May. Now, another year slips by and all that. I do just wanna say that I’ve had more fun and frolics since I turned forty than I had ever had before. Wow – let’s ratchet it up for the next decade. Maybe a little extra chilli and garlic, maybe a slightly deeper red wine over a longer lunch. Slower breaths and longer kisses have been the wisdom of my ageing. Really truly, this is a deeply serious comment. The English summer is cold and wet so far. The Euro creaks. The money beast bellows. From Greece come stories of mounting suicides and new born babies being held as security in hospitals when mothers cannot pay. Let us not forget love, comradeship and pleasure. It is allowed. Emma thinx: Comrade humans – if not us, then what is humanity? This entry was posted in 50, birthday, Clinton Cards, comradeship, Emma Calin, free e-book, Free Kindle books, Giro d'Italia, giveaway, half century, humanity, KDP Select, Love, paperback, T Rex, Uncategorized, Woolworth by emmacalin. Bookmark the permalink. I don't know. You got me there. I think we are humanity, but more frightened than humane.